Ineke Hans, Maarten Baas and Dirk van der Kooij are just three of the 14 Dutch designers that reimagined chairs in aid of charity. Dutch designer Ineke Hans is the founder of INEKE HANS/ARNHEM in Holland, a design studio that specialises in industrial design and 3D projects. Dirk Vander Kooij is a product designer, best known for using recycled plastic from old refrigerators to create a range of chairs. The first Design Auction at the Venduehuis in The Hague sees 14 Dutch designers creating Chairs for Charity. Tim Erpenbeek, managing director of Venduehuis invited 14 designers to alter a chosen chair to their discretion with a hint of their own unique designing style. All precedes from the auction go to the designer’s chosen charity. The auction will take place on 10 October 2012 at the Venduehuis in The Hague, Netherlands. 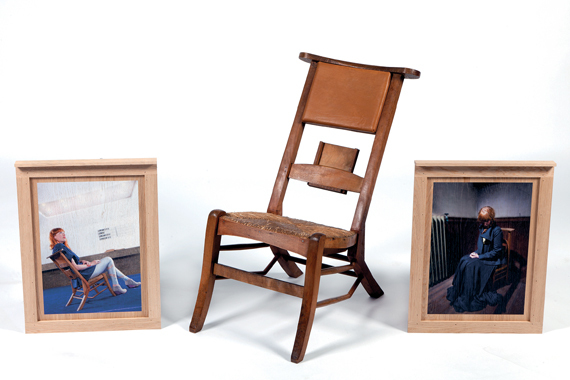 Maarten Baas transforms a chair into a diptych as his contribution to Chairs for Charity. 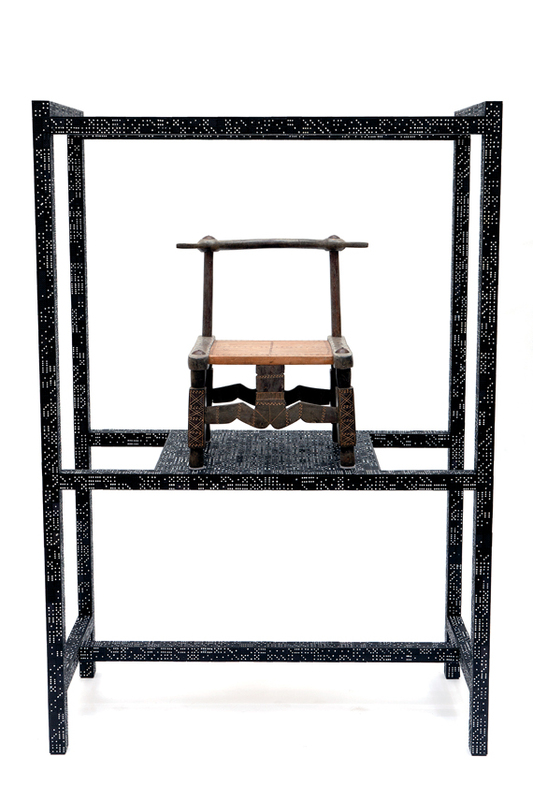 Mimicking his previous work, the Empty Chair, this simple wooden peasants chair is made of synthetic clay that falls in line with his “Clay Furniture” collection. The chair is modelled by hand and reveals fingerprints symbolising the wrapping of clay around the steel frame by hand. Baas’s charity of choice, Amnesty, is representative of the "peasant", being a charity dedicated to human rights and the freedom of speech. Ineke Hans is known for her love of layers and colour. 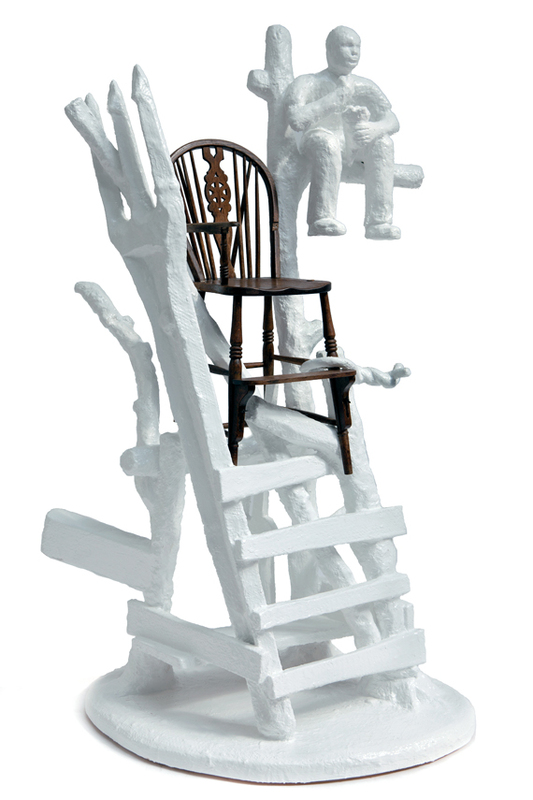 Her contribution to Chairs for Charity is a cheerful and playful piece. Taking full advantage of her workshop, she created an extended chair to either seat two people or serve as a storing compartment adjacent to the chair. 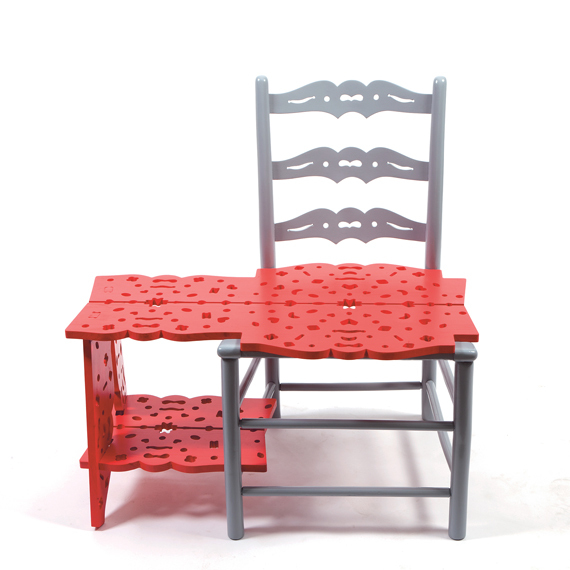 Her design is decorated with an openwork pattern and tiny holes on the seating. Hans’s chosen charity is Sofa Fonds, a foundation that supports special furniture focussing on young talented designers. 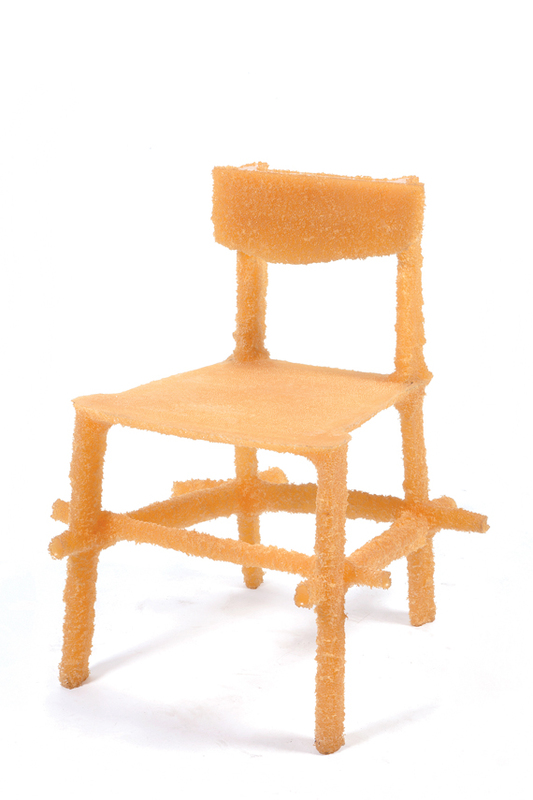 Dirk van der Kooij transforms a child’s desk chair into as adult chair using recycled plastic. Known for his designs symbolising endless motion, the chair seems to extend from its base with the possibility of never stopping. The chair is made out of seven separate parts that integrate to create a balanced appearance. Van der Kooij’s chosen charity is theKWF Kankerbestrijding, the Dutch Cancer Society. The late Ed Annink, once creative director of Ontwerpwerk, collaborated with Christie van der Haak to create a solitary space for reading. 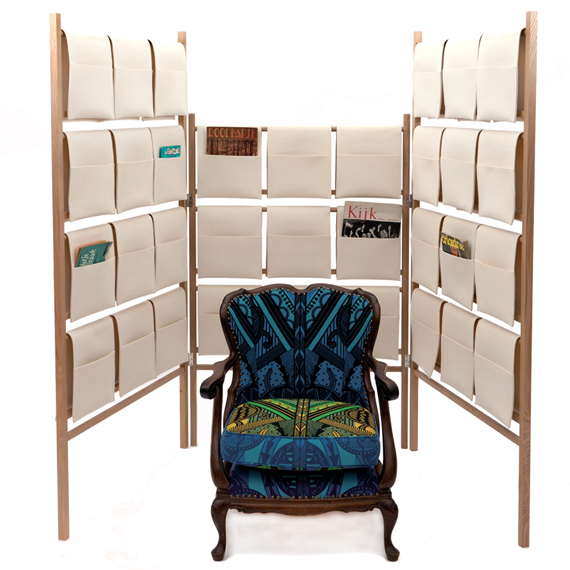 Annink asked Van der Haak to upholster a classic reading chair while he designed the folding screen for privacy. The folding screen encompasses 33 felted bags ideal for storing magazine, books and even an iPad, while the reading chair brightens the space with Van der Haak’s homespun colourful fabric. Annink’s choice of charity is the KWF Kankerbestrijding, the Dutch Cancer Society. 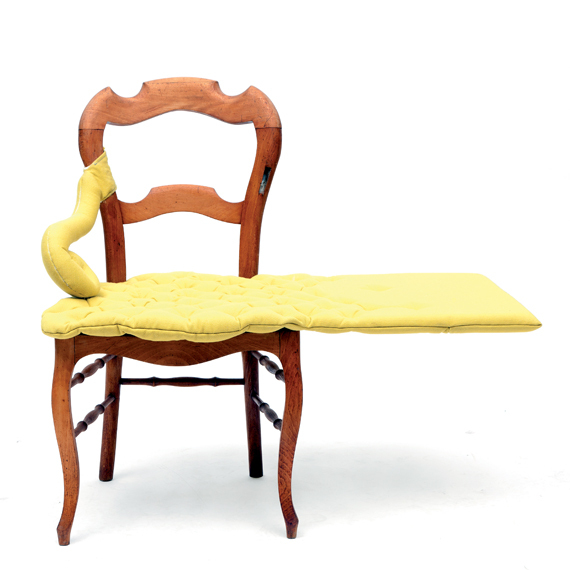 The inspiration behind Sander Bokkinga’s alteration of a chair is nostalgia. Lighting fires and building huts is reminiscent of the designer’s childhood in Rotterdam. Being known for playing with contradictions his chair offers an unexpected view of the ordinary. Bokkinga’s charity is Wakker Dier, a charity for animal welfare. Internationally renowned designer Jan des Bouvrie stays true to his well-known trademark: white. 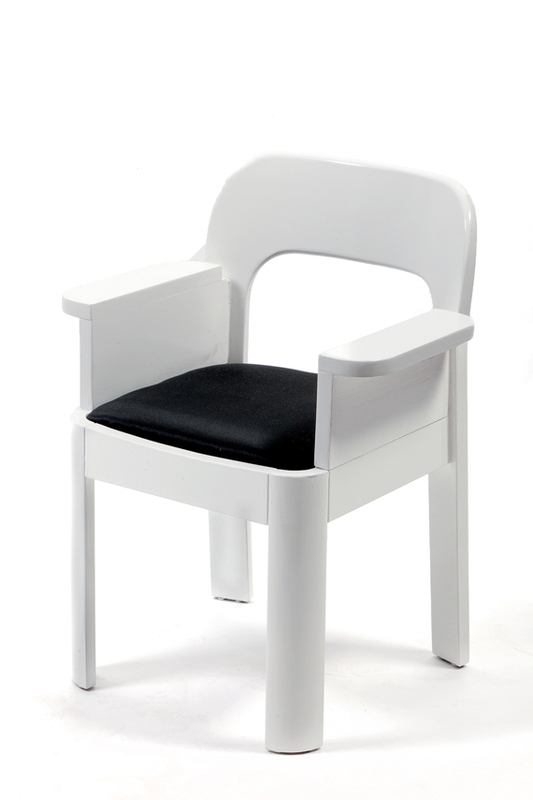 His contribution to Chairs for Charity is a simple and elegant chair revealing his signature style. The design encapsulates Des Bouvrie’s motto of quality for everyone through its effortless style. Des Bouvrie’s charity of choice is Kika Kinderen Kanker Vrij, a cancer foundation focussing on children. 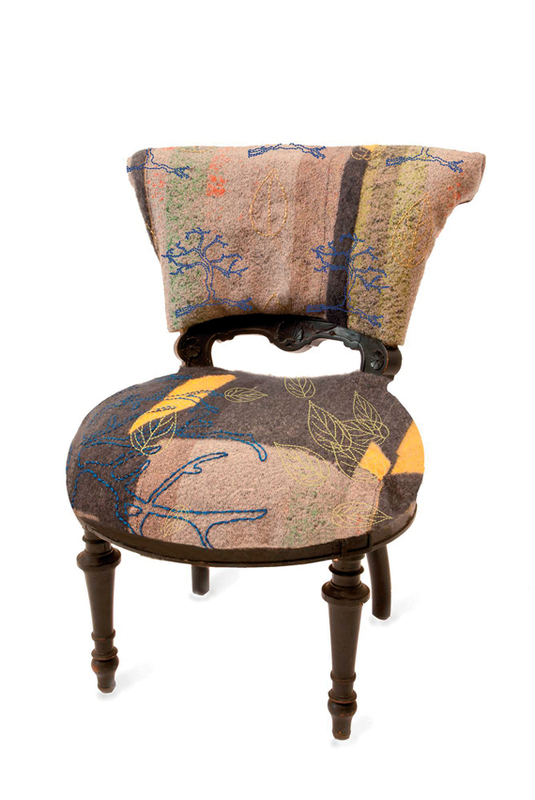 Kiki van Eijk reuses the obtainable fabric of a chair to create a unique type of fabric. She took the existing material to the Textile Museum’s Textile Lab to experiment with creating a one-and-only drapery for the chair. She further embroidered images of trees and leaves to mimic her chosen charity Bomenstichting, a tree foundation. A call for interaction is Richard Hutten’s contribution to Chairs for Charity. 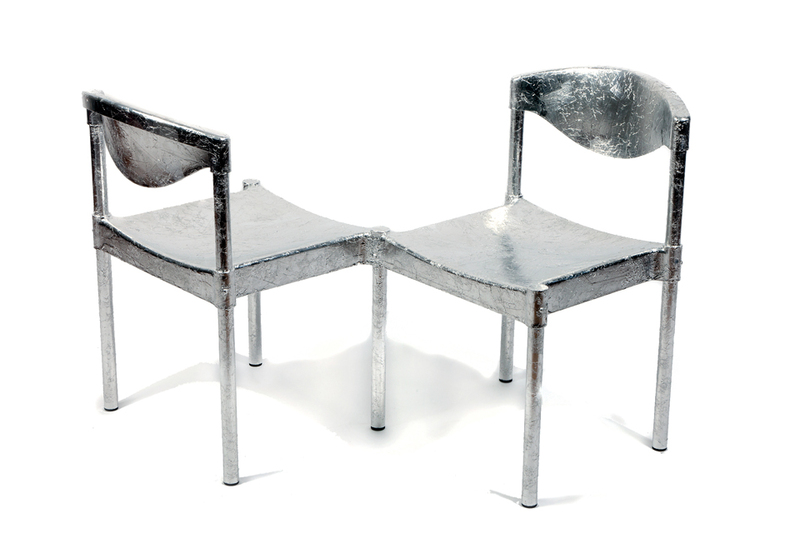 Hutten merged two chairs together sharing one leg and covered with a thin layer of silver foil giving the chair a sense of surrealism. The chair is representative of Hutten’s 90s series "Thing”. As the chairs face one another, the twin object calls for interface communication. Hutten’s choice of charity is Warchild, an organisation that aids children in war zones. Jewellery designer Ted Noten has altered his chair to mimic his personal career. The designer chose a chair with an enormous bulge alluding to personal memories accumulated in the chair, in the same way that jewellery encompasses many memories. Furthering this idea, Noten fitted a zip into the seat of the chair to allow for personal storage of tiny objects. 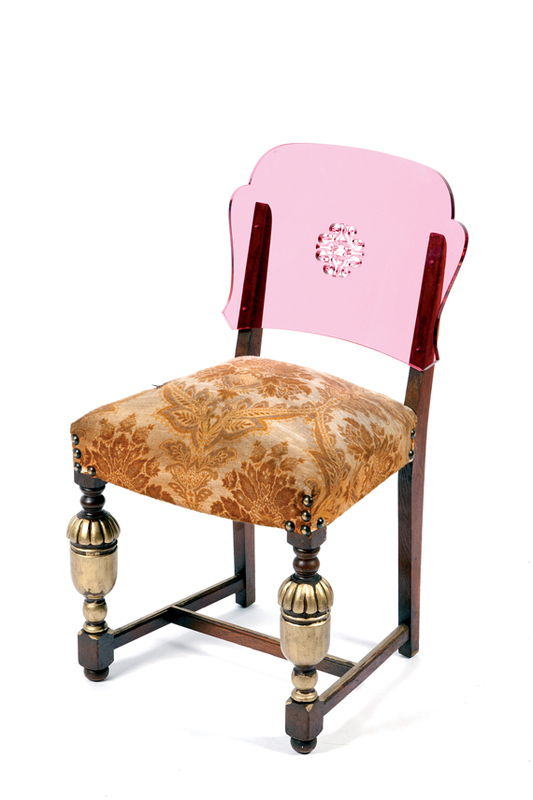 The chair’s original seat contrasts with its pink acrylic back. Noten chose the Nationale Stichting ter Bevordering van Vrolijkheid as his charity, a network of artists, dramatists and musicians who bring cheer to children in asylum centres. Alexander Pelikan chose a chair that could be taken apart and transformed into a completely different shape. The chair’s parts were separated and reassembled to create a dresser, falling in line with Pelikan’s desire and wish for transformation in his work. ICEERS, the International Centre for Ethnobotanical Education, Research and Service as his charity of choice. Rutger de Regt’s inspiration for his chair alteration is his passion for invention and experimentation. Collaborating with Marlies van Putten, the duo created a one-of-a-kind chair reminiscent of a honeycomb. 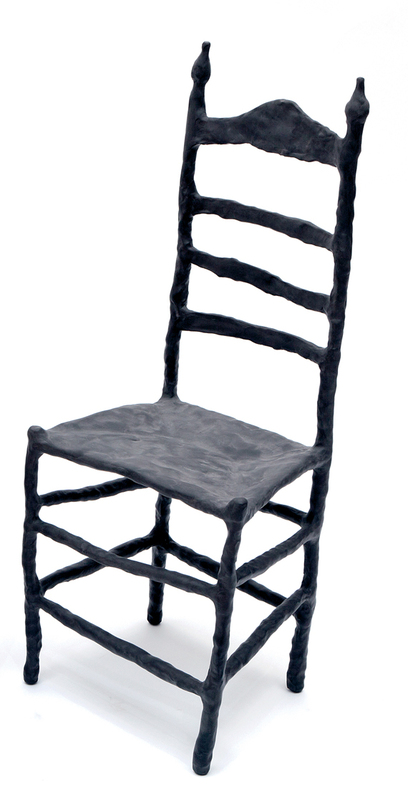 This effect was achieved through moulding the chair with a flexible polyurethane rubber. De Regt chose Stichting MS as his charity, an organisation for Multiple Sclerosis. Tejo Remy alters a simple and elegant chair by incorporating a foam extension. This idea sparked from his desire to see what could be achieved when working with a chair. The foam extension serves as a side table that naturally flows from the seat of the chair. Dutchenne Parent Project is an endeavour to research muscular dystrophy, and Remy's choice of charity. Tiddo de Ruiter seeks to solve the discomfort of traditional prayer stools, usually being extremely upright. De Ruiter transforms the erect stool into one that is tilted enabling the churchgoer to be more comfortable during a sermon. De Ruiter chose Natuurmonumenten, a nature conservation organisation as his charity of choice. 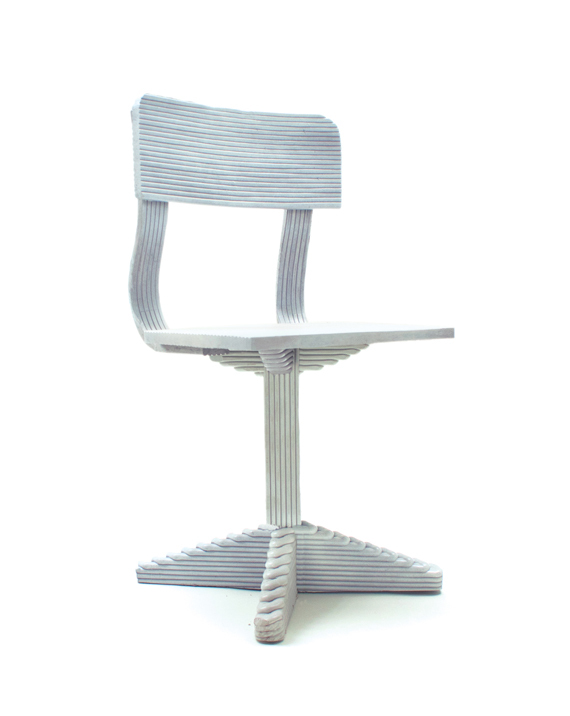 Onno Schelling’s contribution is a chair that is viewed as a piece of art. The chair is too small for an adult’s chair and too mysterious for a child’s chair. Schelling placed the chair inside a cabinet taken from one of his personal collections. 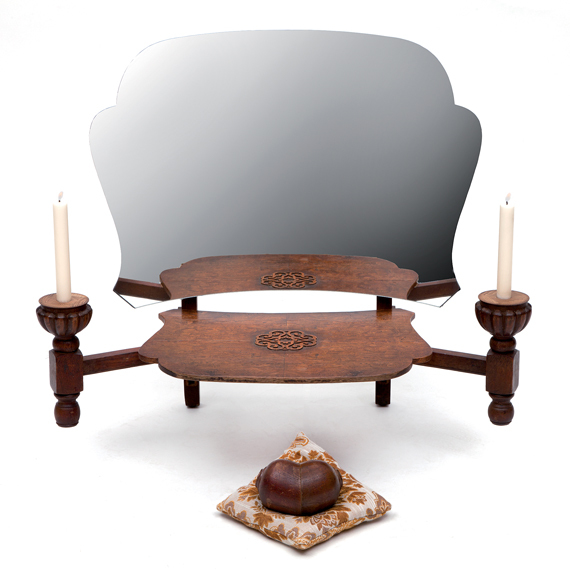 The chair and frame is decorated by hand with tribal design resulting in overall visual pleasure. Schelling chose the KWF Kankerbestrijding, the Dutch Cancer Society as his charity of choice.